Sun, 19 Jun 2011 | Published in I Was There . 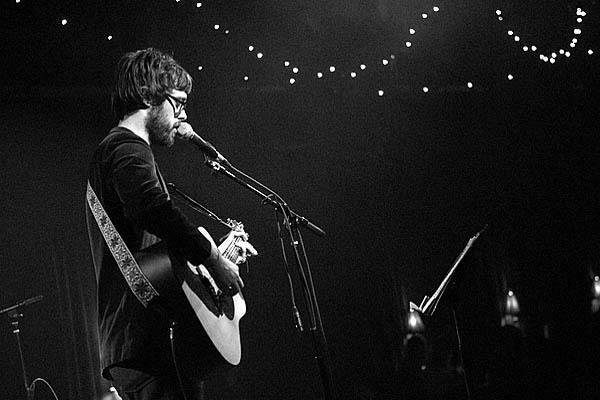 . .
On Saturday, June 18th, Minneapolis singer/songwriter Jeremy Messersmith, who’s been recognized by both the New York Times and NPR, performed with a full band and string section at Mercury Lounge as part of his East coast tour in support of the first installment of his album trilogy, The Reluctant Graveyard. It was the first time he’d been on the road with a full band since this year’s SXSW Festival in Austin, Texas. Messersmith has been noted for his ear for melody and resonant lyricism. Although he’s been classified as both an indie power-pop and a chamber-pop player, his album has been called a “concept album about death.” To further complicate matters, I find his musical style rather folky at times. Overall Messersmith put on a performance that was sweetly engaging and moving.